We enter the Parks through its Southern and thus traditionally Main Gate. 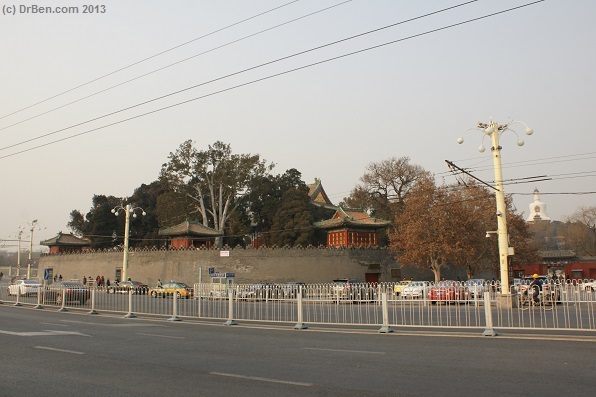 The Southern Main Gate can be found just a few hundred meters West of the Southern Gate to Jingshan Park. 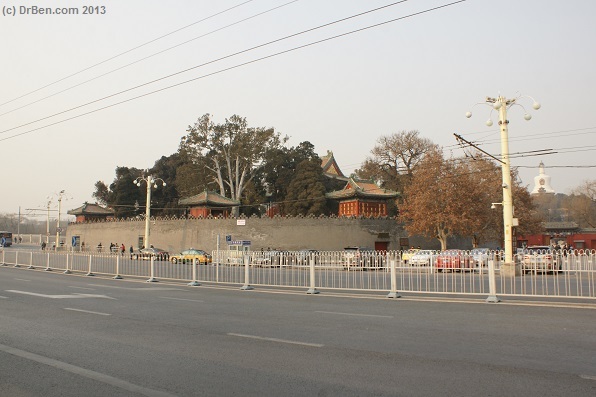 Both Parks are located directly North of the Imperial Palace grounds, or Forbidden City, a huge complex located in the exact middle of the (Ancient) City of Beijing. 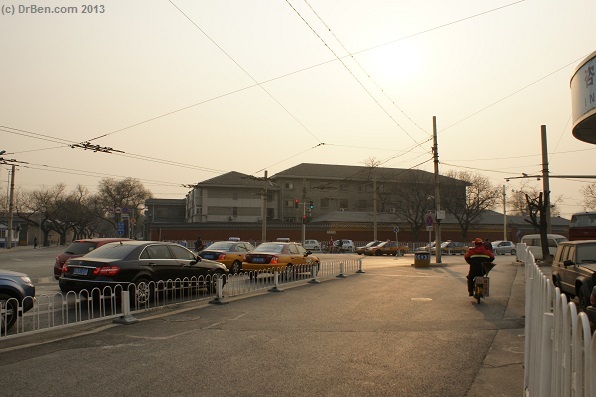 To the West of here is another (SW) Entrance, adjacent the Former Imperial Library, giving access to a long road west around Beihai. 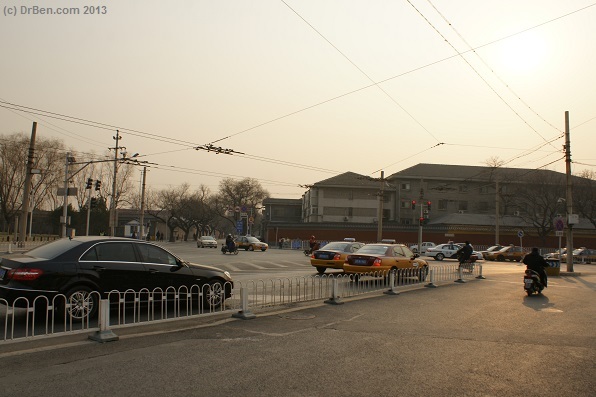 The North Shore is best reached through the North Gate, where Qianhai flows into Beihai. Altogether, the Park has 5 gates, at all of which entry can be gained. Please buy a Entrance Ticket at the booth to the Right and East. 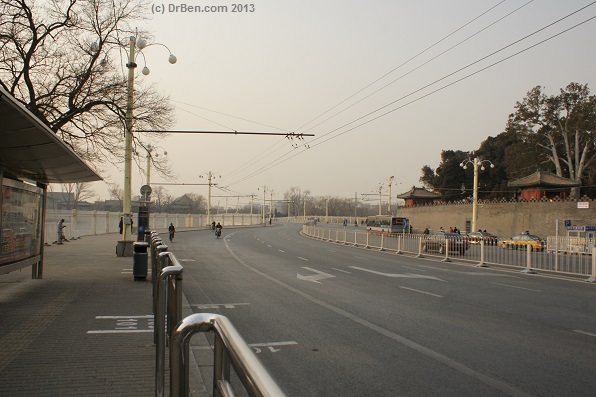 Welcome to The Beijing Report's Digital Introduction to the Beihai (North Lake) Park. 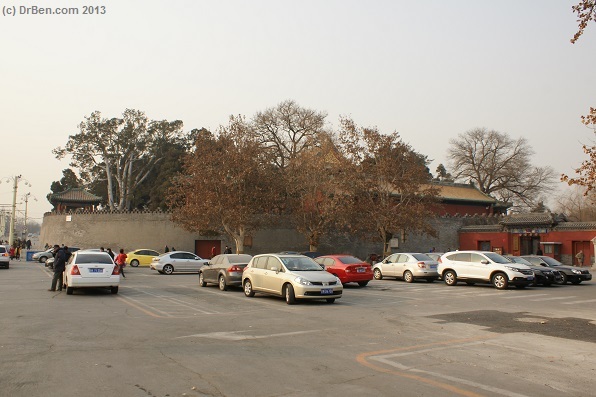 The Beihai Park , located in the North-Western DongCheng district is one of Beijing Cities' larger Parks and a pass-time retreat for many a local citizen. 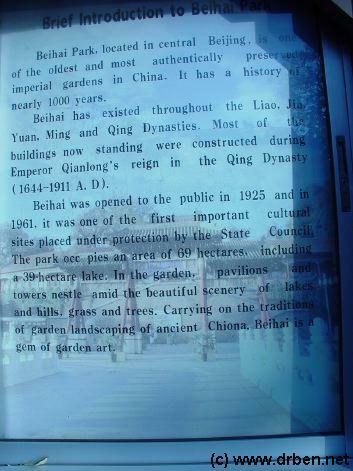 Plaque at the Main South Gate with a written introduction to Beihai Park. 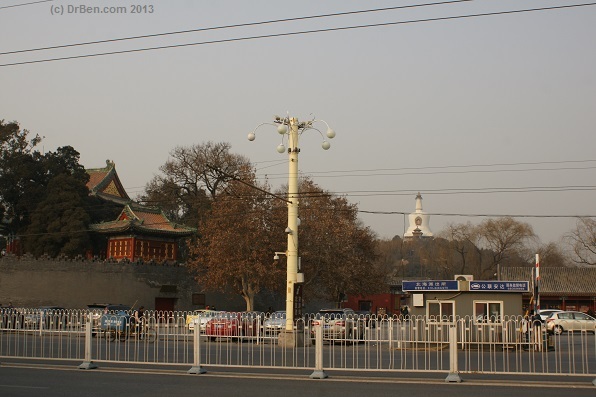 The first history of the Park goes back to the year 1260 AD when the Mongol Kublai's ruled the City of Beijing, then named Kanbalik , and their Imperial Yuan Palace was located here. 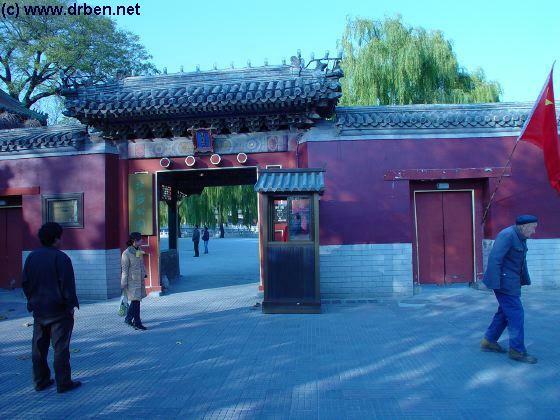 Later when the entire City of Beijing was reconstructed and layed down in its current plan (1406 - 1420 AD ) during the reign of 3rd Ming Dynasty Emperor Yongle, the Beihai Park was restructured and turned into the Imperial Families' pleasure Garden. , was expanded and turned the centerpiece of this magnificient and Classical example of a Chinese Garden. A Glazed Tile Map , in an attempt mimic a Ming Syle appearance. 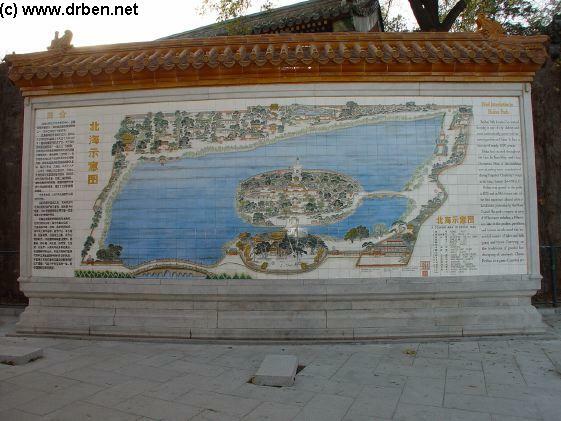 The Map clearly shows Jade ( Qionghua ) Island in the middle of the central TaiYe Lake , which also know as the North Lake. 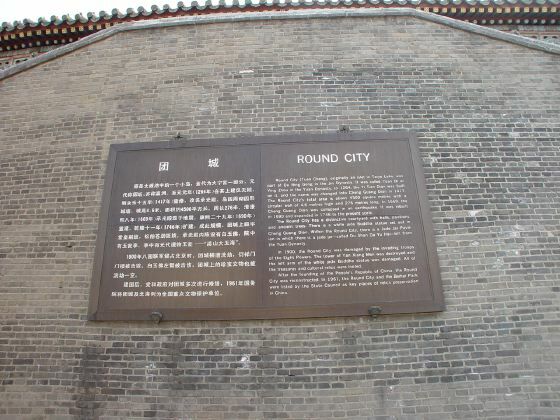 The accompanying text however is basicly the same as on the plaque outside, next to the Southern Main Gate. As mentioned on this plaque the Park and Lake history go back even farther then the Mongol Khans, to about 1000 AD. However, during the reign of the Kublai Khan , the Beihai Lake was expanded using man-power. The hand-excavated material was then used to build a mount on the Lakes Central Jade Island, where apart from the Yuan Dynasty Imperial Palace , there was also a large Temple constructed. 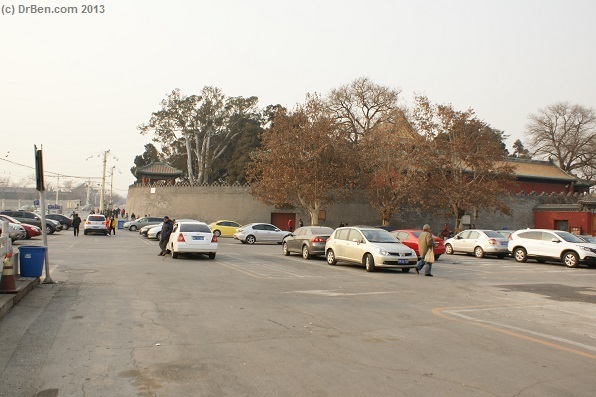 however not as the Imperial Palace site since 1420 AD when the Gugong or so called Forbidden City was completed. important cultural relic known as the white Buddha. The White Buddha was a gift from Burmese Monks. 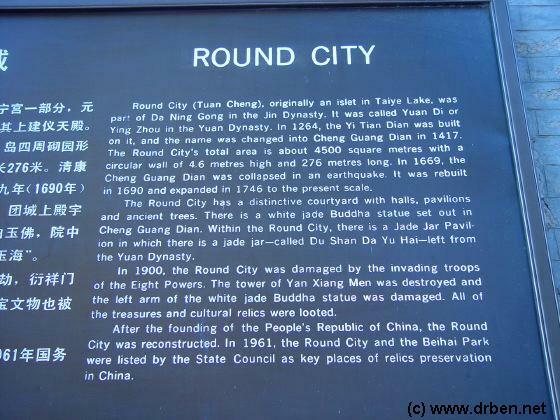 Only small parts of the original round city remain today. The plaque tells us of multiple destructive events, the last of which being the invasion by the 8 power European Forces in 1900 AD as a punishment for Chinese assertiveness and emancipation. A reaction to the Boxer Rebellion. 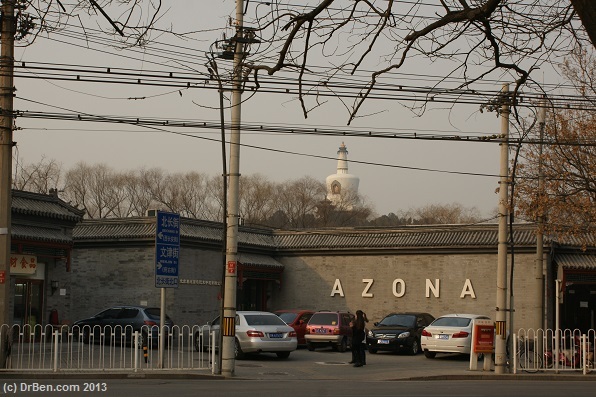 The White Buddha that was damaged in that event is still inside this newly constructed Round City (or circular city) at the South-side of Beihai Park and the North Lake. Interested visitors can see it on display within , together with an ancient Green Jade jar said to have been part of the Kublai Khans' court belongings. 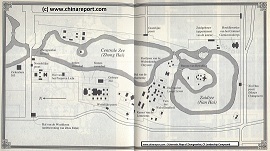 During the reign of the Great Ching Emperor Qianlong , who lived during the 17Th Century the Imperial Garden Beihai would take it's current shape. The Garden now includes a Variety of important Imperial Family Shrines, Emperor Qianlongs' resting and studying Quarters, of which he had many, and of course the Famed Beihai White Dagoba, a masterpiece of Buddhist Art dating back to the 16Th Century. All of these can be found on the Central Jade Island. 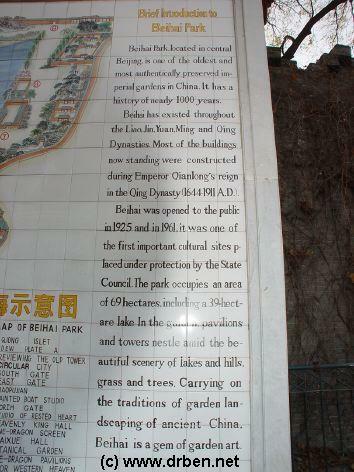 Apparently, Beihai or North lake Park were opened to the Public in 1925 AD. This was some years after China had descended into what was to become a protracted Civil War. After all of this misery, when the China Communist Party was firmly in power the Park was opened to the Public once again. 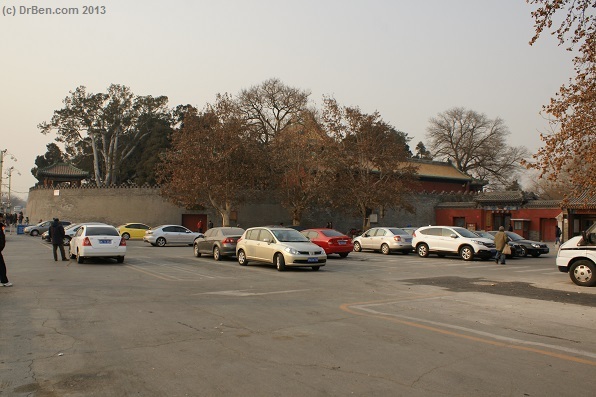 Eversince, the 69 hectares of the Park have been a popular playfield for all of Beijing's citizens, young and Old. 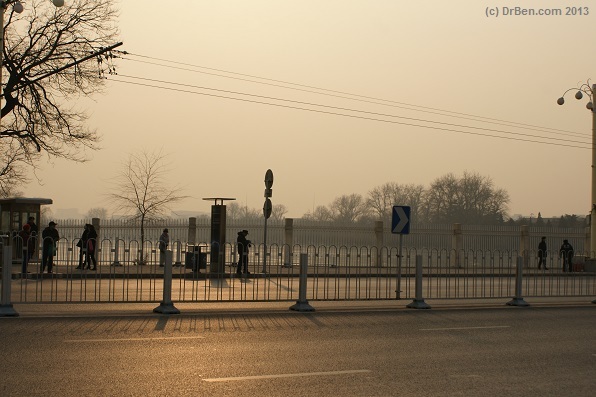 The Park, which is taken up half by the Beihai (North) Lake itself is a place to cool down and relax in summer, and in winter it is the Biggest skating ring of the City. 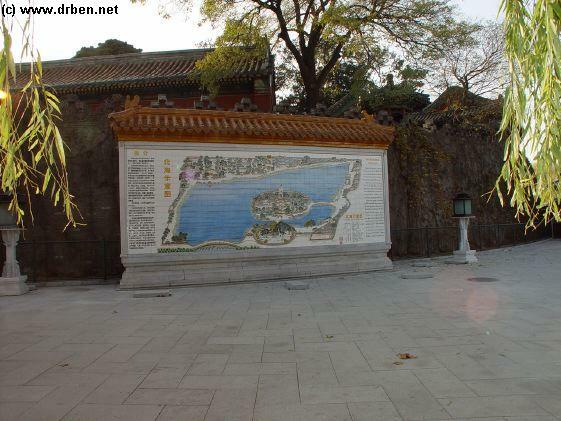 Everyone enjoys Beihai Park, and as such it is still the Jewel of the City. Make the detour to the Round City. A ticket ( such as displayed) costs only 1 yuan. 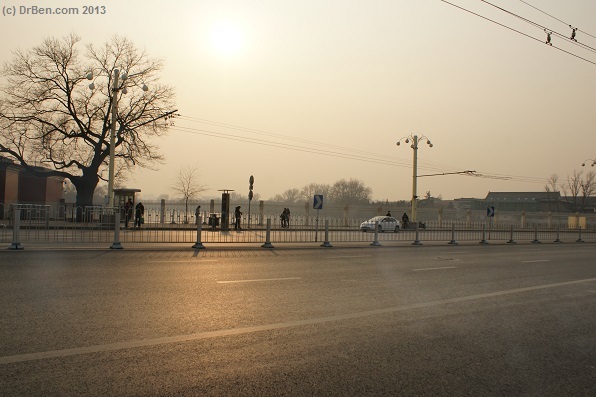 Enjoy a view of the Forbidden City and the Middle Lake ( Zhonghai ). The Inner Sanctum of this Circular City holds an interesting Buddha housed in a colorfully decorated Temple-building. No photography of the Sacred Buddha is allowed. Map of DongCheng District with Location of Bei Park and Gates. Click Map to go to Full Version. 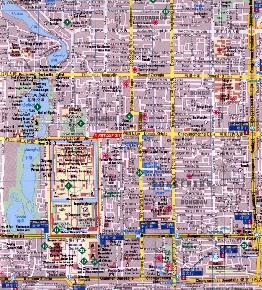 Map of Beijings Secretive Zhongnanhai (Park) CP leadership compound just south of Beihai.